You may have asked, when you saw my recently-published photo of pioneering Hare Krishna devotees in the Sydney Domain all those long years ago in 1970: Where are they now? 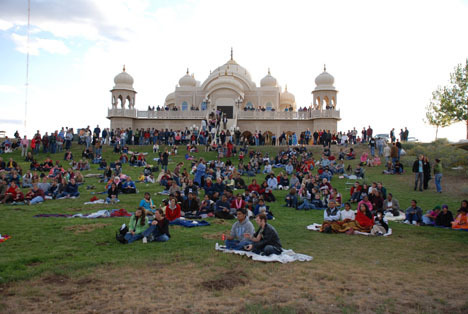 Well, I was browsing through the internet and came across my own article posted on the website of the ‘Krishna Temple and Cultural Center’ in Spanish Fork, Utah. ‘Hang on – what’s the connection?’, you ask. The gorgeous temple and center hosts over thirty thousand visitors a year, including college students, families, home schools, seniors, community service groups, primary and secondary schools, festival goers, the curious, interested, and casual passersby from all over the USA. It was conceived and built by none other than my dear old friends Caru and Vaibhavi, the same Chris and Christine seen chanting in the Domain with Upendra in the picture below. 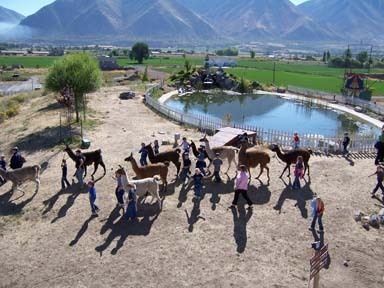 Along with the Temple, Cultural Centre and Radio Station KHQN-AM, Caru and Vaibhavi have a Llama farm on the property, and regularly hold very popular Llamafests. 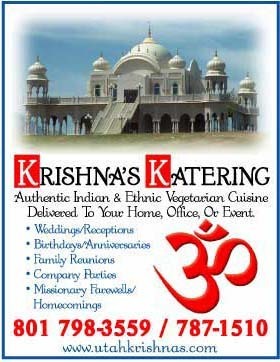 As with all Krishna temples, the food is very popular, especially with the local Mormons. Notice the wording of the poster above. If you’re visiting Utah, be sure to put aside a day to visit this wonderous place in Spanish Fork.